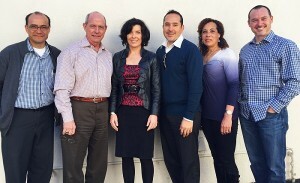 Pictured above are WEV’s current instructors: Sergio Zepeda (Spanish, Santa Maria); Gonzalo Fernandez (Spanish, Oxnard); Julie Samson (English, Santa Barbara); Armando Sahagun (Spanish, Oxnard); Paula Crutchley (English, Ventura County); Masen Yaffee (English, Santa Barbara); and Jeff Alkazian (not pictured, English, Ventura County). In January, we had the opportunity to convene our instructors for ‘Training of Trainers,’ but it’s truly more of a meeting of the minds. Aside from administrative updates, our instructors need no training and draw from their own (and each other’s) experience instructing, consulting and succeeding as entrepreneurs in their own right. WEV’s instructors are often the face of WEV for the clients in our classes, and the train conductor who takes clients through the journey of entrepreneurship. They each bring such wonderful yet differing personalities and experiences to the table. All are small business owners (and one retired business banker) with busy lives, yet they make WEV clients a priority during the class. They go above and beyond to make themselves available to clients, and genuinely care about helping each client succeed according to the individual’s definition of success. If you’ve had a chance to experience the community built in the classroom of one of these instructors, or the opportunity to work with them individually in another capacity, please share! As a volunteer instructor for the sales segment I get to see Paula Crutchley in action. Her experience and confidence are an encompassing calm that no doubt fosters the learning environment very well at WEV. Thanks for introducing your slate of instructors.